If you are in the “Young, Restless, and Reformed” crowd, you’re probably very familiar with Kevin DeYoung. He’s kind of a “poster child” for the movement because… well, he’s young and Reformed. I’m not sure about the “restless” part, however. At any rate, DeYoung has some influence in the “neo-reformed” movement (my thoughts on that term here and here). Kevin DeYoung has written or edited some very good books and also reflected on issues related to missional theology that I am not convinced of. No matter what, DeYoung is a hardworking pastor-author who obviously cares deeply about Jesus, the gospel, and the church. 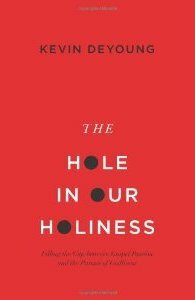 His latest book, The Hole in Our Holiness is a book about the issue of sanctification. It’s a short (159 pages!) popular-level book that addresses the issue of how Christians reflect on sin and holiness and how the gospel interacts our approach to becoming conformed to the image of Christ. It’s semi-exegetical, doctrinal, and very practical. In other words, it has many of the marks of a good pastoral approach, IMO. The list of well-known pastors, scholars, and even professional football players who endorse the book is amazing (John Piper, Randy Alcorn, Michael Horton, Nancy Guthrie, C. J. Mahaney, and Washington Redskins quarterback Kirk Cousins). Does the book live up to hype of the endorsements? On many levels, I found The Hole to be very, very good. It addresses a significant problem facing the church… a lack of concern for personal holiness. And yet DeYoung also does a good job of avoiding the common pitfall of true legalism (he discusses the difference between what is real legalism and what is just called legalism) or perfectionism. If you are looking for a work addressing the issue of Sanctification from a semi-traditional Reformed perspective, this is a good popular treatment of the issue. DeYoung takes time to clarify the differences between Justification and Sanctification that are hallmark issues for those who are of the Protestant Reformed. DeYoung starts the book by discussing what he says is “the reason for redemption.” After acknowledging that God has saved us because he loves us and for his own glory, he reminds us that Eph. 1:3-4 indicates that “God saved you so that you might be holy.” This, then, serves as the starting foundation for where DeYoung is going. This is helpful because DeYoung rightly understands that the positional nature of a Christian is in Christ. He’s more concerned that Christians are moving forward towards Christlikeness. I appreciate that balance. All in all, I think DeYoung’s book is important and should be ready by many. There are points where I would differ with his approach or conclusion, but they are minor and if anything, this has been great food for thought and has brought about an important discussion within some of the circles I travel in. Thanks for this review, Luke. Might have to check it out.